This is a very useful compression tool that support all the common compression formats: Zip, RAR, 7z, ISO, TAR and Gzip. It has been developed using the same technology that Igor Pavlov used with his successful 7Zip software, thus producing compression ratios that are equivalent to those of the big names in the industry, as well as a quality compression engine that is reliable. The files generated with this application are totally compatible with other applications on the market, like WinZip, WinRAR and 7-Zip. jZip has a simple interface that makes things very easy for the users. The functions have been simplified, trying to make the software suitable for all kinds of users. Among the new functions that have been added it's worth highlighting that it can also run from the command line terminal, task that is perfectly explained in a tutorial. 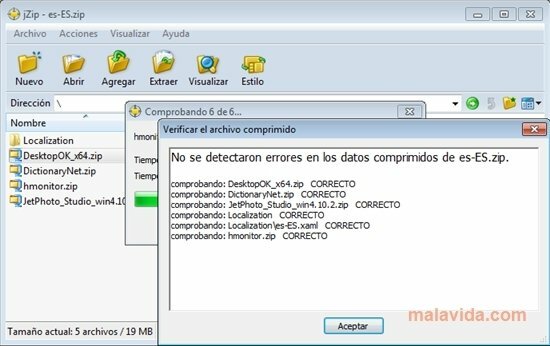 If you were looking for an alternative compression program that included all the functions that could be asked for from a utility of this kind, jZip is the perfect solution. Furthermore, it offers two additional bonuses, it's free and in constant development.